20 June 2005 Wall Street Journal "Viacom to Acquire Children's Web Company Neopets" by Joe Flint and Nick Wingfield reports the media giant, Viacom, purchased Neopets, a closely held Glendale California company, for about $160 million. Membership at Neopets, although free, has grown to 25 million members from 90,000 in 2000. Advertising makes up about 60 percent of the site revenue with most of the remainder coming from games and merchandise. Viacom hopes to build the site's consumer products business. 22 Feb 2005 Wall Street Journal "Web's Addictive Neopets Are Ready for Big Career Leap". . by Nick Wingfield. Article talks about the "built in advertising" opportunities called "immersive advertising" developed by Neopets, the popularity of the pets, retail opportunities, stickiness of the site (length of visits), bans on religious and political discussion, strong appeal of the site to girls, trying to keep the site safe and fun. It is an excellent review of the Neopets site and the issues surrounding it. 2 March 2002, The Times Online of Northwest Indiana article by Tim Shellberg titled, Nothing Like The Real Thing", discusses robotic pets alongside those from a humane society. We were interviewed for the article. In February of 2002 we encountered a site featuring the Petster from Axlon. Petster was a mid-1980's robotic virtual pet available as a dog, cat, penguin, spider, Godzilla dinosaur and a goldfish. Its great to see someone writing about them. Many of today's robotic pets are direct descendants from them. January 2002 we encountered a new Japanese virtual waterpet from Tiger Electronics called Mutsu (Water Looper). It has its own little pool and even its own website, http://www.mutsu-web.com. At first the pet is very timid as it matures it begins to play and show emotions. It comes with its own friend, Michi. Mutsu appears to have multiple outcomes per this Japanese growth chart. 16 January 2002 - Historical note - I discovered a nice page on the old Little Computer People game from Activision that includes a copy of the manual. This game was a major forerunner of the world of virtual pets. The game page and manual are hosted by TheUnderdogs.Org. Dec 2001 Blipz launches a virtual pet raising contest where you are given a number of points at the start and loose them or gain more depending on your level of care. If you are going to be out of town a while you can have your pet flash-frozen in the cryogenics lab when you leave and thawn out when you get back, but it costs you some points. The site is funded by advertising. 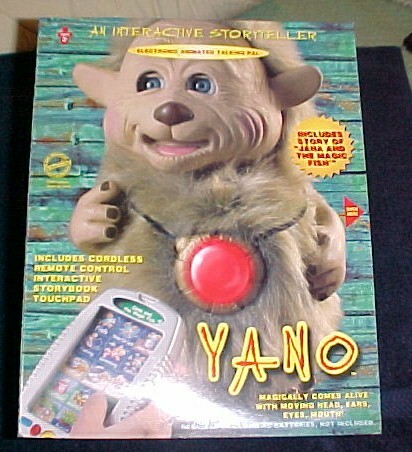 Yano Electronics introduced Yano Interactive Story Teller for Christmas 2001. The pet accepts story cartridges and is controlled by a wireless remote. It tells storys and reacts to the text. Cartridges are being marketed with additional stories. Matsushita Electric' new robotic pets named Tana and Kuma contain sensors that record a persons vital signs via contact with the individual. They are designed for the elderly. Doctors and family members can remotely access the data. Popular Science. July 2000. Sega Dreamcasts's Seaman was reviewed by CNN 11 August 2000. Seaman grows from an egg into a virtual aquarium. He is a virtual fish with a human face that talks to you. Pocket Monsters TV Cartoon Causes Hundreds of Seizures in Japan 17 December 1997. Playmates Toys (Nano Pets) is to announce a new linking pet Thursday December 18 at F.A.O. Schwarz in New York City. A Virtual Pet newsgroup named alt.toys.virtual-pets.was formed by late July 1997 (we reported on it 29 July 1997). It was an "alt" newsgroup that was not monitored. Language or topics were not always fit for children, but it received a lot use and was reasonably clean. alt.pets.tamagotchi was created somewhere in that time frame and a high tech toys newsgroup called alt.toys.hi-tech was probably already up and going. By late 2001, alt.toys.furby (formed much later) still has some activity, but the rest look pretty dead. Our Recent Developments and Trends in Keychain Virtual Pets, a major history of the evolution of keychain pets was web published in mid-1997. Extensive coverage of the early Tamagotchi craze news is provided on our Tamagotchi page. TOKYO (Reuter) - Japanese toymaker Bandai Co.Ltd said Tuesday its hit product "tamagocchi," an electronic bird creature the size of an egg, is to make its debut overseas. A Bandai official said the company decided to start offering the " virtual pet" in Europe this spring and in the United States and Asia at around the same time. Tamagocchi has become the latest craze in Japan, selling out everywhere and hawked on the street for more than 20 times its retail price of 1,980 yen ($16). The digital pet can be fed and stroked and "goes to the bathroom" -- in an electronic sense -- just like a live pet. It will "die" if neglected. Psychologists have said the pocket-sized creature fills an emotional void in modern Japan's urban society by allowing its owners to smother it with affection. The toymaker is still mulling whether it should modify the exsisting model for overseas markets, the official said. He added that the specific timing for the sales is undecided. Bandai last month said it will merge with game giant Sega Enterprises Ltd on Oct. 1. Copyright 1997 Reuters Ltd. All rights reserved. Tamagotchi to be available May 1, 1997 at selected K-B Toys locations in New York, New Jersey, Connecticut, California, Hawaii and Washington State. Also available at selected K-B Toy Works locations in New York, Connecticut and New Jersey. The coverage will be expanding during May. Check their website for details.